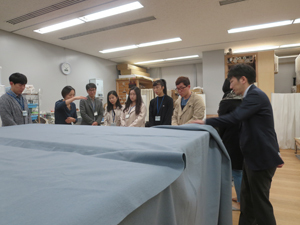 On November 1st, the visitors toured in the Tokyo National Research Institute for Cultural Properties (TNRICP) with the intention of learning how books and materials are stored and utilized. They received briefings at the Library and at the Kuroda Memorial Hall from the staff in charge. 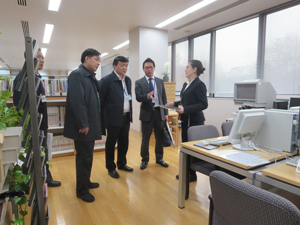 On November 7th, with the intention of obtaining fundamental information on the studies of the preservation of cultural properties in Japan, the visitors toured in TNRICP. They received briefings at the Chemical Laboratory II, the Restoration Studio (Paper), etc. from the staff in charge. On November 20th, the visitors toured in TNRICP with the intention of learning restoration of cultural properties, data management for cultural properties, etc. They received briefings at the Library and other sites from the staff in charge. On November 22nd, the visitors toured in TNRICP to receive briefings on the facility and research projects of TNRICP. They received briefings at Department of Art Research, Archives and Information Systems, etc. 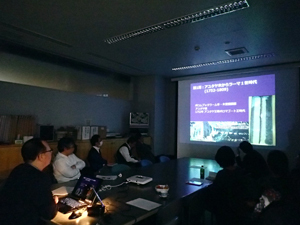 Department of Art Research, Archives and Information Systems held a two-day open lecture on November 2nd and 3rd in the seminar room of the Tokyo National Research Institute for Cultural Properties (TNRICP). Every autumn, TNRICP invites people from the general public to attend presentations given by its researchers and invited outside lecturers on the results of research that they conduct on a daily basis. This year, it was the 51st open lecture. This program is not only held as part of the Lecture Series of the Ueno no Yama Cultural Zone Festival organized by Taito Ward but is also associated with Classics Day on November 1st, 2017. 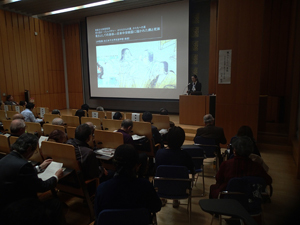 This year’s lectures covered four topics: “Japanese paintings that were brought overseas ― Through introduction of the folding screen, “Merry making on kamo river beach at shijo” in a collection at the Grassi Museum for Ethnology in Leipzig, Germany” (Tomoko EMURA, Head of Archives Section, TNRICP); “Human bodies depicted as this impure world― Illness and dead bodies depicted in Japanese medieval paintings” (Satomi YAMAMOTO, Professor of Kyoritsu Women’s University); “Loquats painting copied from nature― Tanyu KANO and reproduction in Edo Period” (Mayumi ONO, Senior Researcher, TNRICP); and “Great poets making tofu baked and coated with miso ― Paintings of Great Poets by Jakuchu ITO” (Miho MABUCHI, Associate Professor of Kobe City University of Foreign Studies). The first two lectures were given on the 2nd and the latter two lectures on the 3rd. The audience on both days totaled 225 people and, according to the results of the questionnaire survey, nearly 90% of the audience responded “satisfied” or “almost satisfied.” Thus, the open lecture received favorable reactions. In Thailand in the 18th century and after, exquisite raden craftwork in which an enormous number of tiny seashell parts are finely combined, has developed. If you have already visited the Grand Palace and Wat Pho famous for Reclining Buddha in Bangkok, the capital of Thailand, you may know it. The raden craftwork has been still continued, although not very extensively. However, there have hardly been any studies on the history of Thailand’s raden; its transition and social significance has not been researched not only in Japan but also even in Thailand. At the 9th seminar held by the Department of Art Research, Archives and Information Systems, Prof. Tomohito TAKATA of Siam University who is specialized in Buddhism art history in Thailand gave a presentation on the history of Thailand’s raden in the early-modern and modern times. Mr. Takata, first of all, explained that raden works in Thailand are seen on the doors and windows in Buddhism temples, on the pedestal bowl offerings for monks, and on the sutra boxes and Cabinets, they had been donated closely related to Buddhism, and they had been made rather exclusively with strong relationship with the royal family of Thailand. Further, he chose, as the analysis subjects, the temple doors whose dates of making or construction are accurately known and divided the history of raden from the 18th to the early 20th century into three periods according to the differences in the main motifs, patterns and techniques utilized. The three periods are the 1st period (from the middle of the 18th century to the beginning of the 19th century), the 2nd period (from the first half to the middle of the 19th century), and the 3rd period (from the latter half of the 19th century to the beginning of the 20th century). Based on this, he further pointed out that, in the 1st period when the patterns and motifs only included tendril patterns and portrait of the deities in which external influences were hardly observed, the Buddhism values such as the three realms of existence were expressed in raden works like in other wooden sculptures and paintings. In contrast, the 2nd period characterized by appearance of the story of Ramayana as well as Chinese decorative patterns reflects diplomatic relations with China and East Asia during this era. Further, in the 3rd period when the patterns that expressed forms of medallions in raden were made, new relationship between Thailand and the West as well as an increase in power of the royal family gave influence over raden crafting. The workshop also included participation of Ms. Ayumi HARADA, expert in Thai art history, from Kyushu National Museum and Prof. Norihiko OGURA from Department of Crafts (Urushi-Art) of Faculty of Fine Arts, Tokyo University of the Arts. Ms. Harada gave us comments on the origin of Thai raden, external relations, etc. from the expert’s point of view. 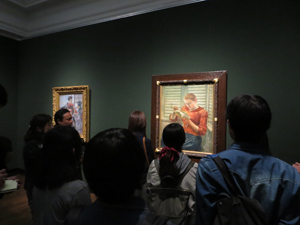 Further, Prof. Ogura delivered opinions from a viewpoint of an artist. The workshop also contained active discussion about relationship with Japanese raden works of the 19th century that have been discovered successively in Bangkok in recent years. The workshop could also serve as a good opportunity to recognize significance of Thai raden that had not often been subject to academic discussions. 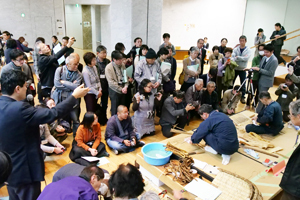 On November 13th, “Summit Conference on Winnowing Baskets ― Discussion of Weaving Techniques” was held at Tokyo National Research Institute for Cultural Properties (TNRICP) and over 80 people concerned participated from all over the country. The winnowing basket is a farm tool to sort and carry grain. Although it was an essential tool in everyday work up until the high economic growth period, the demands then sharply dropped because of modernization of people’s way of life. As a result, the weaving technique is also facing the crisis of inheritance. 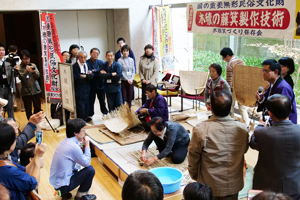 Therefore, with the aim of holding a discussion on how to pass on such basket weaving techniques to future generations, among the winnowing basket weaving techniques that are the nationally designated as important intangible folk cultural properties (folk technique), we invited successors of the Oidara winnowing baskets from Akita City of Akita Prefecture, the Kizumi winnowing baskets from Sosa City of Chiba Prefecture, and the Ronden/Kumanashi winnowing baskets from Himi City of Toyama Prefecture to hold demonstrations and panel discussion. The objective of this summit was to share current situations and to promote mutual exchange among various people who are concerned with winnowing baskets, including creators, sellers, users, fans, and researchers. With regard to inheritance of folk technique, although an investigative approach including research and recording is important, what these studies can contribute to actual succession of technique is very little. In order to inherit technique from one person to another, maintaining demands in the era is indispensable and, for that sake, it is important to change technique in line with the times in a flexible manner. In search of the solution, it is necessary to address the challenge by gathering, as extensively as possible, the wisdom of people who are concerned with winnowing baskets. At the panel discussion, the current severe conditions in technique succession were introduced and many participants presented opinions on what efforts the sellers are making, what problems they are facing, what features of the winnowing baskets attract users most, etc. We would like to develop a network of the participants that was created through this summit, while continuing to discuss and work on inheritance of techniques of winnowing basket making. 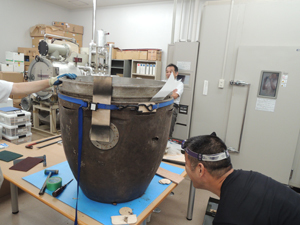 The Center for Conservation Science, under the request of International Christian University, together with Japan Aeronautic Association, conducted survey of two materials which were excavated on the university campus in 1950 and were most likely to be parts of a jet engine. A survey conducted at the university on May 20th, 2017 revealed that they were likely to be exhaust nozzles of a jet engine manufactured in Japan during World War II. In response to this result, a more detailed investigation was conducted at the Center’s laboratory from July 6th to October 26th. In addition to survey of the literature and visual inspection, measurement of major dimensions and weight and survey of the structure material were carried out, together with photographic recording. Furthermore, X-ray CT photography was conducted with the cooperation of the Tokyo National Museum for the purpose of investigating the composition of the material and the internal structure. One of the two surveyed materials consisted of two parts. 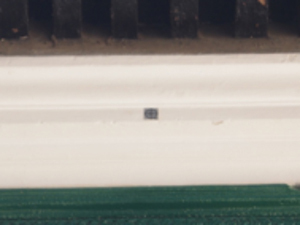 After being carried into the Center, it was carefully separated, foreign matters such as dust and dead leaves adhering to the surface were removed, and anticorrosive treatment was provided. 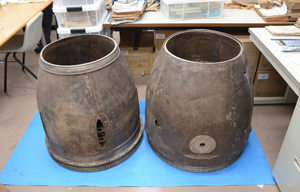 Through the investigation, it has been confirmed that there are engravings similar to those engraved on other Japanese aircrafts manufactured during the wartime, all parts are made of stainless steel and therefore heat resistant, and the shape and structure are similar to the exhaust nozzles of jet engines “ネ130” and “ネ330,” which were also developed in Japan during the wartime. As a result, it is concluded that the materials are highly likely to be exhaust nozzles of a jet engine made in Japan and that the corresponding engine is “ネ230,” developed together with Hitachi by Nakajima Aircraft Company, which existed during World War II on the grounds of International Christian University. The exhaust nozzles are considered to have been never used because of the absence of any traces that they were attached to the body of a jet engine using bolts. Out of the jet engines developed in Japan during the wartime, only two examples of parts have been confirmed to exist. Therefore, the materials surveyed this time are quite valuable, showing both the advancement of Japanese technology in the 1940s and the process of the aircraft development in Japan. On October 26th, the representatives of the survey team visited International Christian University and submitted an interim report to President Junko Hibiya. In the future, the final report will be compiled including results of the survey on the value as cultural property. The staff members of the Tokyo National Research Institute for Cultural Properties (TNRICP) participated in the 30th General Assembly of the International Centre for the Study of the Preservation and Restoration of Cultural Properties (ICCROM) held in Rome, Italy, from November 29th to December 1st, 2017. ICCROM was founded based upon the decision at the 9th Session of the UNESCO General Conference in 1956. 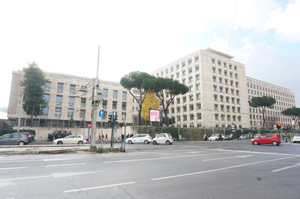 It is an intergovernmental organization with its headquarters located in Rome since 1959, especially characterized by covering a wide range of cultural properties, regardless of whether they are movable or immovable. It is well known as one of the three Advisory Bodies for the World Heritage Committee and is in a cooperative relationship with TNRICP over many years especially through training activities for preservation and restoration of cultural properties made of paper and urushi lacquer. The General Assembly of ICCROM is held biannually. During the latest General Assembly, Dr. Webber Ndoro nominated by the Council to be a candidate for Director-General was elected to serve as the new Director-General starting January 1st, 2019. As Dr. Ndoro is the first Director-General from Africa, it is expected that ICCROM’s projects in Africa will be further activated during his term of office for a period of 6 years. Further, as has happened in the past, an election was also held due to the expiration of the term of office for about one-half of the Council members. As a result of the election, the Council members from Belgium, Egypt, Sudan, Switzerland, and Germany were reappointed, while new Council members were elected from China, Dominica, Lebanon, Poland, Swaziland, the U.S., Portugal, and Russia. In the thematic discussion, various cases were introduced under the theme of “Post-conflict Reconstruction – Recovery and Community Involvement.” From Japan, Prof. Toshiyuki KONO of Kyushu University made a presentation on reconstruction efforts of buildings in Japan after World War II. TNRICP intends to continue working on collecting information on the international trends regarding preservation of cultural properties and widely transmitting the activities carried out in Japan. 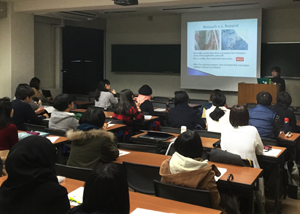 On November 24th, three Associate Fellows from the Tokyo National Research Institute for Cultural Properties (TNRICP) held special lectures for the Forum for Cultural Resource Studies at the Center for Cultural Resource Studies of Kanazawa University. TNRICP and Kanazawa University entered a cooperative research agreement in 2014 and the TNRICP’s staff members have been cooperating in training, field survey, etc. for the “Graduate Program in Cultural Resource Management”, the University’s Leading Graduate School program that develops specialists in preservation of cultural properties. The special lectures on the day concerned the areas of expertise of the Associate Fellows and the TNRICP’s activities, which included the following three: “An Introduction to Heritage Science” (Mariya MASUBUCHI), “Struggle to Conserve Nepalese Cultural Heritage Damaged by the Gorkha Earthquake” (Hiroki YAMADA), and “Origin and Characteristics of the Japanese Law for the Protection of Cultural Properties” (Asuka SAKAINO). Students showed keen interest in the lectures, which were followed by an active Q&A session. It is our pleasure that, through these lectures, we could contribute to the educational program for students aiming to become specialists in preservation of cultural properties and, at the same time, it was a valuable experience for the TNRICP’s staff members who had not often had opportunities to speak to students. We will continue maintaining and further developing exchanges with Kanazawa University and other academic organs by utilizing the expertise of our staff members. 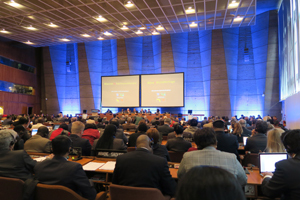 On November 14th and 15th, 2017, the 21st session of the General Assembly of States Parties to the World Heritage Convention and the 12th extraordinary session of the World Heritage Committee were held at the UNESCO headquarters in Paris, France. Tokyo National Research Institute for Cultural Properties (TNRICP) dispatched two staff members. The General Assembly of States Parties to the World Heritage Convention is held biannually during the period of the ordinary session of the General Conference of UNESCO, where the Committee members of the World Heritage Committee are elected. 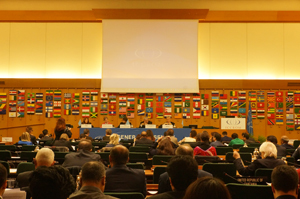 Although the World Heritage Convention sets the term of office for the Committee members to six years, with the aim of expanding the opportunity for many countries to become a Committee member, the Operational Guidelines invite the Committee members to consider voluntarily reducing their term of office to four years and discourage from seeking consecutive terms of office. At this General Assembly, 12 countries retired from the Committee members after serving for four years and, as a result of the secret ballot among the States Parties participating in the session, the countries of Australia, Bahrain, Bosnia and Herzegovina, Brazil, China, Guatemala, Hungary, Kyrgyzstan, Norway, Saint Christopher-Nevis, Spain, and Uganda were newly elected. It is the normal practice of the World Heritage Committee sessions to update the World Heritage List and to decide on the site and date for the next World Heritage Committee session. However, at the 41st session of the World Heritage Committee that was held in Krakow of Poland this year, there was no Committee member that officially expressed its interest in hosting the World Heritage Committee session for the next year. Therefore, it was decided that, concurrently with the re-election of Committee member countries at the 21st session of the General Assembly of States Parties to the World Heritage Convention, the 12th extraordinary session of the World Heritage Committee was to be held to invite a country that wishes to be a hosting country and to decide the site and chairman of the Committee session. As a result of adjustment at the extraordinary session, it was decided that the 42nd session of the World Heritage Committee would be held in Manama of Bahrain from June 24th to July 4th, 2018. TNRICP will continue to collect the latest information on recent trends concerning the World Heritage Convention and to disseminate it widely among parties concerned in Japan. 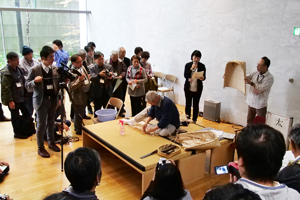 Workshops on Conservation of Japanese Lacquerware (urushi objects) have been held since 2006, with the cooperation of Museum für Ostasiatische Kunst, Museen Köln (Museum of East Asian Art, Cologne), Germany. The workshops introduce the knowledge and techniques required for the preservation and utilization of lacquerware overseas. In these past 10 years, 179 professionals and students in total had participated from 17 countries. 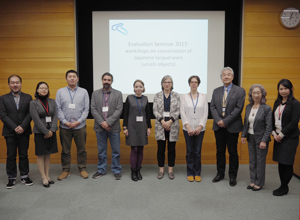 In order to measure the outcomes of the past workshops, this year, an evaluation seminar was held at Tokyo National Research Institute for Cultural Properties (TNRICP) on November 8th and 9th, 2017. Prior to holding the seminar, a questionnaire survey targeting all former participants was conducted. Contributors to the seminar were gathered from the respondents of the questionnaire, and 4 specialists and professors in conservation and restoration were invited from 4 countries (Belgium, Germany, Greece and the USA). On the first day of the seminar, the contributors presented their conservation projects and/or educational activities in conservation, which were undertaken after they participated in the workshops. The presentations provided the opportunity to share their situations and challenges on how the acquired knowledge and skills were applied to their work. The second day started with reporting the results of the questionnaire survey from TNRICP, followed by an in-depth discussion with the contributors. Issues on conservation of lacquerwares overseas and how we can support to address such issues by providing the workshops were considered. Staff members have ongoingly been dispatched to Nepal under the project regarding the above subject that has been entrusted by the Agency for Cultural Affairs. Field surveys were conducted by six experts from October 29th to November 10th and by two experts from November 20th to 26th. First, with regard to a group of buildings surrounding Aganchen Temple in Hanumandhoka Palace in Kathmandu, following the survey in June, recording current conditions and detailed measurement for preparation of a restoration scheme were performed. Concurrently with this, the structural engineer team mainly consisting of members of the Institute of Industrial Science, the University of Tokyo, carried out measurements by 3D scanners. 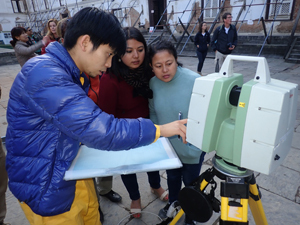 As there are some areas inside the Palace where entry of foreigners are restricted due to religious reasons, we instructed local staff members from Department of Archaeology, Government of Nepal, regarding how to use the surveying instruments and conducted the measurement works in cooperation with them. Although entry prohibition imposed a restriction on implementation of the survey, it seems to have served at the same time as a good opportunity for promoting transfer of skills. Next, for the interior walls that had already been surveyed, the finishing layers were peeled off and specifications as well as conditions of the underlying brick wall were examined. This process is not only necessary in order to accurately identify the damage conditions of the brick walls but also very important in order to clarify the transition of the building. Especially, for the places that may have to be torn down for reasons such as very severe damage, observation with utmost care and deliberation was needed as this survey might become the last opportunity to survey and record historical evidences. Further, with the aim of continuously monitoring any possible adverse effects on the buildings adjacent to the work area throughout the restoration work, we installed the targets for displacement measurement and glass plates for the fixed-point observation of wall inclination at various spots, and measured the initial values. On the other hand, we have also worked on documentation of the excavated artifacts from the excavation research that was conducted near the Shiva Temple inside the Palace in June. Further, instructions and advices were given to the staff of Department of Archaeology on the methods of documentation. Two years and a half have passed since the earthquake that caused extensive damages to cultural properties as well and restoration projects led by teams of various countries have finally become active. We also would like to continue supporting the above-mentioned restoration project in which restoration specialists from Japan participate while working on transfer of skills to the local engineers.